Dividends are a type of investment income that's generated from stocks, as well as from mutual funds that contain stocks. They represent a share of corporate profits paid out to investors, and they're taxable. If your income includes dividends, this presents some special considerations at tax time. Dividends can be taxed either at ordinary income tax rates or at the preferred long-term capital gains tax rates. Dividends that qualify for the lower long-term capital gains tax rates are referred to as qualified dividends. 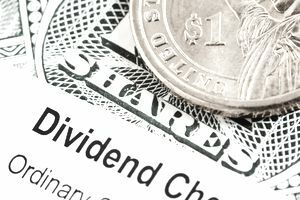 To be considered a qualified dividend, an investor must have held or owned the stock unhedged for at least 61 days during the 121-day period that begins 60 days before the ex-dividend date, according to the IRS. But this holding period can be longer in the case of preferred stock. These assets must be held for at least 91 days during a 181-day period that begins 90 days before the ex-dividend date. This rule applies if the dividends result from time periods exceeding 366 days. The tax treatment of qualified dividends has changed somewhat since 2017. They were taxed at rates of 0, 15, or 20 percent through 2017, depending on your regular income tax bracket. Then the Tax Cuts and Jobs Act (TCJA) came along and changed things up effective January 2018. The rates are still set at 0, 15, and 20 percent, but now long-term capital gains have their own tax brackets—at least through 2025 when the TCJA potentially expires. Beginning with the 2018 tax year, you'll fall into the 0 percent long term capital gains tax rate for qualified dividends if your income is $38,600 or less if you're single, $77,200 or less if you're married and you file a joint return with your spouse, or $51,700 or less if you qualify as head of household. The new 15 percent tax bracket kicks in and applies to incomes above the 0-percent thresholds up to $425,800 for single filers, $452,400 for head of household filers, and $479,000 for married filers of joint returns in 2018. These long term rates remain the same in 2019, but the income thresholds for each have changed to keep pace with inflation. These figures are indexed for inflation so they can be expected to increase incrementally each year through at least 2025. The 0-percent limits are set at $39,375 for single filers in the 2019 tax year, $78,750 for married taxpayers who file joint returns, and $52,750 for heads of household. The 15-percent income limits increase to $434,550, $461,700, and $488,850 respectively. Only those with incomes in excess of the 15-percent thresholds are faced with the 20 percent capital gains tax rate in both 2018 and 2019. Your dividends are taxed exactly the same way and at the same rates as your salary, wages, or other earned income if they're not considered qualified. You might also receive dividends from a trust or an estate, from an S-corporation, or from a partnership. Regardless of whether the corporation or partnership pays you in cash, stock options, or tangible property, the transaction still represents dividends and the value must be reported on your tax return. You should receive Schedule K-1 for dividends from these sources. All other dividends are reported to investors on Form 1099-DIV. Dividends are typically ordinary unless a Form 1099-DIV states otherwise. Ordinary dividends are reported on Line 3b of your Form 1040. Qualified dividends are reported on Line 3a of your Form 1040. Be sure to use the Qualified Dividends and Capital Gain Tax Worksheet found in the instructions for Form 1040 to calculate the tax on qualified dividends at the preferred tax rates. Non-dividend distributions reduce your cost basis in the stock by the amount of the distribution. The IRS has issued a new Form 1040 for 2018 which replaces the old 1040, Form 1040EZ, and Form 1040A. These lines and entries refer to the new tax form. Forms 1040EZ and 1040A are no longer available beginning with the 2018 tax year—the return you'll file in 2019. You must still report dividend income on your tax return even if for some reason you don't receive a Form 1099-DIV. Dividends are still taxable and must still be reported if you reinvest them, purchasing additional stock. Schedule B is a supplemental tax form used to list interest and dividend income from multiple sources. Using Schedule B is required if you have over $1,500 in interest income and/or dividends. It can be helpful to use the form to tally up your interest and dividends for reporting on your Form 1040 even if you're not required to file it with your tax return. Dividend income can also prompt the Additional Medicare Tax, which has been in place since the 2013 tax year. This tax is in addition to any income tax you might owe on your dividends. If you're single with a modified adjusted gross income (MAGI) of $200,000 or more, or if you're married and your MAGI is more than $250,000, you must pay an additional 0.9 percent of your net investment income toward this Medicare tax. The income threshold is $125,000 if you're married but file a separate return. The Net Investment Income Tax (NIIT) is a heartier 3.8 percent. It kicks in at income thresholds of your net investment income or at the same limits as for the Additional Medicare Tax, whichever is less. All taxable dividends are considered investment income, even if they're taxed at ordinary rates.